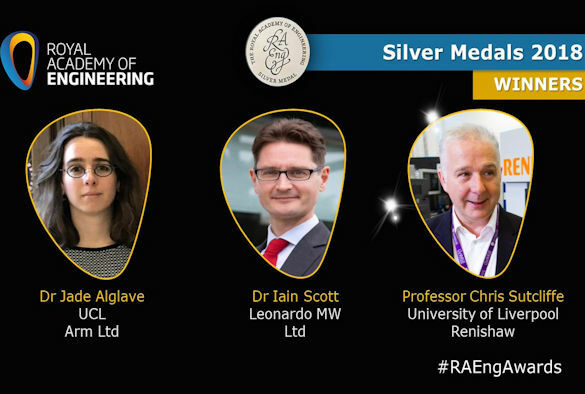 Professor Chris Sutcliffe, who is responsible for the development of 3D printed metal implants that help relieve the suffering of thousands of patients each year, has been awarded the Royal Academy of Engineering’s prestigious Silver Medal. The Silver Medal, established by the Royal Academy in 1994, recognises an outstanding and demonstrated personal contribution to British engineering, which has resulted in successful market exploitation. As a result of the pioneering work of Professor Chris Sutcliffe and the engineering company, Renishaw, 3D printed metal implants are used to treat patients who have experienced trauma or debilitating joint disease of the hip, knee and spine. This new-class of bone-integrating implant uses 3D printing to mimic spongy bone tissue, enabling rapid integration between the implant and the bone and providing far better long-term performance and stability than traditional designs. The 3D printed metal implants are now routinely used in both human and animal surgery. Professor Sutcliffe is also the founder and director of Fusion Implants, a University spin-out that produces veterinary implants using the bone-integrating technology in the treatment of musculoskeletal disease and injury in animals. Professor Sutcliffe said: “It is very exciting to see fundamental ideas being translated into products that have a real and tangible impact on patients. We have worked hard to make this a success and this award recognises the efforts of the many engineers and scientists who have turned this into reality. I am very proud to receive this on their behalf and on behalf of the wider additive manufacturing family." 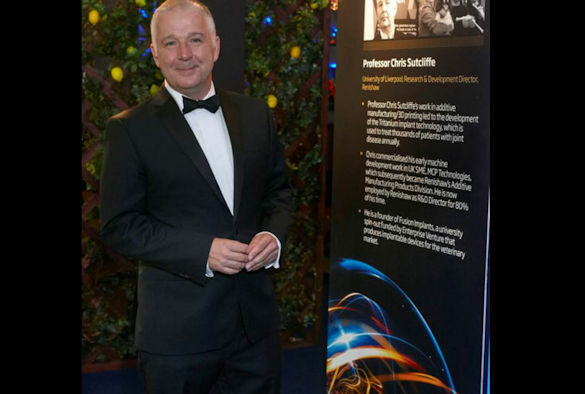 Professor Ken Badcock, Executive Pro-Vice-Chancellor for Science and Engineering, said: "This is wonderful recognition for the work that Chris has done over many years to develop and apply new additive manufacturing techniques. "This has led to patents that have been exploited for major industrial developments, including a new factory which is making 50 thousand medical implants a year. Through his cooperation with Stryker and Renishaw, Chris's research has had a major impact on manufacturing. "The recognition by the Royal Academy of Engineering is both prestigious and well deserved for a long serving colleague who has contributed to the University through his contributions to research, impact and education."